These multi purpose square black rubber multi purpose ferrules, legs, feet, chair leg protector, chair feet, pads, tips, bottoms, are ideal for protecting your floor from damage and scratching. 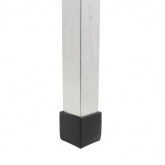 Previously our customers have used them on the bottoms of chair legs and table legs. Light weight and flexible for easy fitting these are extremely durable and long lasting, the perfect solution to your needs. Ideal for church halls chairs, school chairs, nursery chairs, banqueting chairs, restaurant chairs, cafe chairs & function halls chairs & dinning & kitchen chairs.